Hausse Hospitality, a company I run, recently published a report on the African travel and tourism sector. 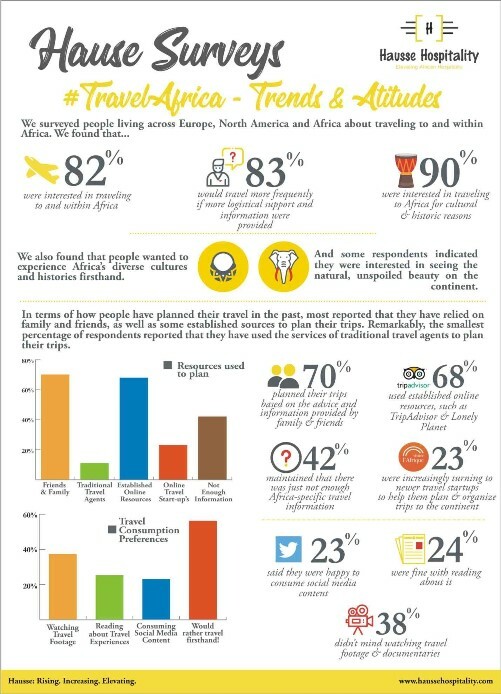 We had also conducted a survey in which we asked people about their attitudes towards traveling to, and within African destinations. The overwhelming response was that people do want to travel to African destinations. However, there is just not enough support and information provided to potential visitors. When these potential visitors start researching travel options, the inadequate information, poor international image, difficulties in obtaining visas, high flight prices, and poor travel connections make destinations like Nigeria and other African countries relatively unattractive. It is important to note that the travel and tourism sector does not only include leisure travelers looking for holiday destinations. It also involves those who visit various destinations for various purposes, including business and investment, professional meetings and conferences, social events, family and friend visits, and so on. In addition, the sector is not only measured by revenues from flight tickets and hotel stays. The World Travel & Tourism Council captures direct, indirect and induced impacts when they conduct research on the sector. The travel and tourism sector’s contribution to GDP usually includes monies spent by travelers and tourists on accommodation, transportation, entertainment and attractions. Economic activities in the sector also include investment spending, government spending, and the impact of such spending on those who are employed directly and indirectly in the sector. Nigeria does not currently receive a substantial share of the holidaymaker market, and to be clear, I acknowledge that the economy is not ready to be marketed as a major leisure tourist destination. However, Nigeria does already attract travelers who visit for some of the other purposes mentioned earlier. And the country certainly needs to do better at providing the necessary infrastructure to accommodate these existing markets, as well as to encourage visitors to travel here more often and stay longer. MasterCard has published its Global Destination Cities Index (GDCI) for the past nine years. In the latest 2018 report, it ranked 162 global cities. The report shows that of all the cities in the sub-Saharan Africa region, Lagos saw the highest number of visitors in 2017. The commercial capital of Nigeria hosted 1.5 million visitors in 2017, and they stayed for seven days on average. These visitors largely came from the United States, United Kingdom and China. And they were also reported to have generated US$589 million in international visitor revenues – spending, on average, US$57 per day. 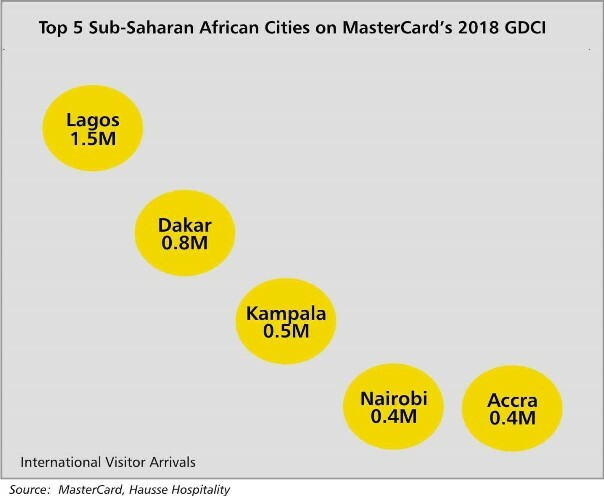 Lagos received more visitors than the two cities in the number two and three spots combined – Dakar had 0.8 million visitors and Kampala welcomed 0.5 million visitors. Nairobi and Accra tied for the fourth and fifth positions with 0.4 million visitors each. Globally, the index was topped by Bangkok, London, and Paris, cities that had 20 million international visitors, 19.8 million international visitors, and 17.4 million international visitors, respectively. There are no African cities in the top 20 positions on this latest MasterCard index. According to MasterCard, the index underscores “the importance of robust infrastructure, both business and leisure attractions and strong local culture.” Lagos and Nigeria have a strong local culture. We could have robust infrastructure as well as business and leisure attractions if the government and other stakeholders can muster the will to grow the travel and tourism sector. Without a doubt, Lagos and Nigeria are important in the national, regional, and international contexts. The country needs to better position itself to receive the necessary attention by improving travel and tourism infrastructure. Doing so will positively impact government revenues, increase employment opportunities and ultimately grow and diversify the national GDP. • Practical and implementable policies. These will encourage investment to grow and thrive in the related industries. • Safety and security measures. These will guarantee the lives of residents and visitors alike. • Commitment to improving infrastructure. The industry requires the supporting infrastructure that only the government can provide. This includes everything from internet connectivity, constructing and maintaining road networks, building and upgrading airport facilities, designating tourist and cultural sites, and, investing in training institutions. • Active participation in trade and regional blocs. The ECOWAS bloc has existed since it was formed by a treaty in 1975, with the objective of promoting economic integration amongst its member-nations. However, besides the visa-free access to member-nations, the average Nigerian national is unlikely to be able to list any other benefits. • Ease of visitor entry. The government needs to implement immigration policies that do not make it unnecessarily difficult for non-citizens to gain legal entry into the country. We need streamlined and consistent visa policies, and more efficient ways to process these visas. Nigerian embassies abroad are notorious for inefficiencies and inconsistencies that turn away the average person. And when people do brave it out through that first layer, they are met with more of the same unfriendly attitudes at their first point of entry into the country. Even Nigerians abroad are subjected to the same inefficiencies, making it difficult for those in the Diaspora to visit the country. • Accountability. This is needed across the board, and especially among the staff who implement these visa and immigration policies. Anecdotally, a participant at a conference hosted in Lagos, took to social media to narrate their experience of obtaining a visa on arrival at the Lagos Airport. They were charged a higher amount than was advertised. And upon voicing a complaint, they were told there was no option but to pay the requested amount or be sent back home. As is typical for most visitors upon entry at the airport, this visitor was also accosted by various staff asking for “gifts.” Stories like these perpetuate negative images and taint the experiences of visitors to the country. Nigerians are tired of telling visitors and each other to “take it like that” or count it as part of the Nigerian experience. We need more transparency in the handling of visa charges and friendlier airport personnel, to avoid situations like these. • Educational institutions. The country needs institutions that focus on training individuals to work or start their own businesses in areas of hospitality, transportation, travel and tour operations, food and beverage, and so on. This is by no means an exhaustive list of what is required to grow the industry. But these are some of the foundational areas that will encourage not only more visits but also have more visitors stay longer. Addressing these areas will also facilitate revenue generation from the sector and improve the country’s international image. Most importantly, we need the buy-in and commitment of Nigerians to be better hosts and provide better customer service, whether as government workers, private employees or business owners.